Happy Monday everyone.. Who's ready for a new release from Newton's Nook Designs? 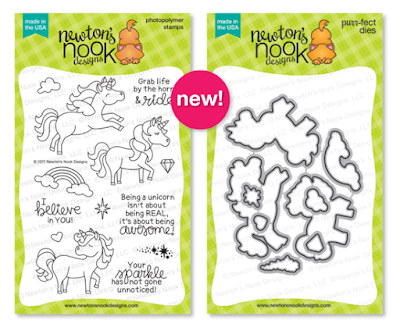 Today we are introducing a Fun new set called Believe in Unicorns and its coordinating dies. I started my card with a piece of Bristol Smooth paper and then I added some Tumbled Glass Distress ink using the Smooshing Technique. Once the panel was dry I added some water splatters and dabbed the water up with a paper towel to create the Distressed look. Then I adhered the panel to a Card base. I stamped the sentiment in the lower corner using VersaFine Black ink. 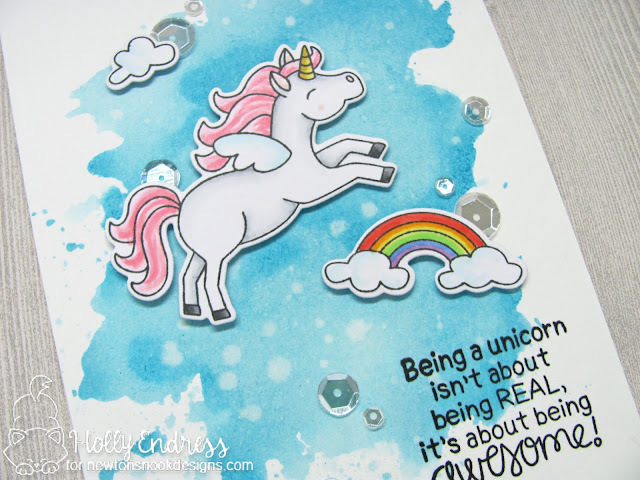 I stamped the images from the Believe in Unicorn set onto some X-Press it blending cardstock using Lawn Fawn Black Ink and then I colored them in with Copics. I used the coordinating dies to cut them out. I adhered each image with some foam tape. For some sparkle, I added some Mixed Sparkling Clear Sequins from Prett Pink Posh. This is a must have set if you are a fan of Unicorns!!! Super cute! Love the unicorns! Great card, I love the sentiments with this set! Perfect sky background for this flying unicorn. I love the sentiment. I just love how the happy colors pop against the gorgeous sky you created on the background! Really beautiful card! I LOVE your sweet unicorn! The background is fun and playful and it looks amazing! Oh wow! Love how the technique for "Smooshing" was used on your card! Your unicorn is so happy!! I love this card! It's very pretty and magical. 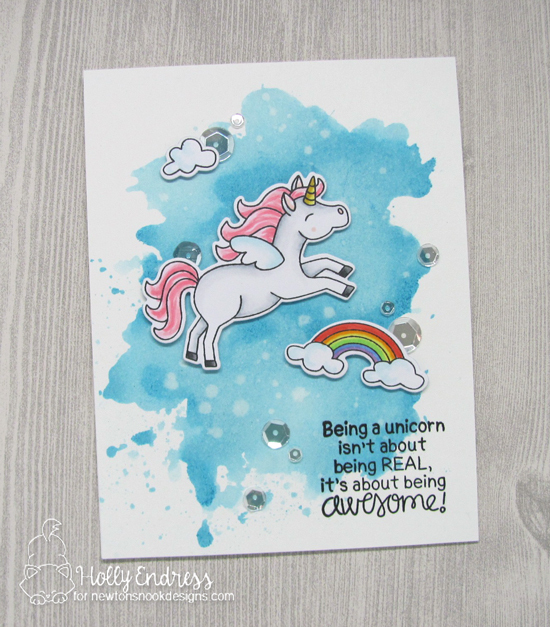 I love unicorn, they are magical, and so is your card! Wonderful smooshed background and I love the sentiment that comes with this cute set. Love the background you created, it's perfect! PERFECT background for the unicorn and rainbow...Pretty card! Lovely background, perfect for this cute unicorn! Adorable! Love that sentiment, and your background is fabulous! Your card is so fun, love that sentiment!! Love the look of the background! Your background is great! Love this card - it is so fun!